One of the core values IBMers wrote for themselves is “Innovation that matters – for our company and for the world.” In our approach to corporate responsibility, this draws us to social challenges where we can matter, where IBM’s innovation and expertise can improve communities and lives. For example, we are applying the power of cognitive technology and IBMers’ thinking to challenges in health care and education. 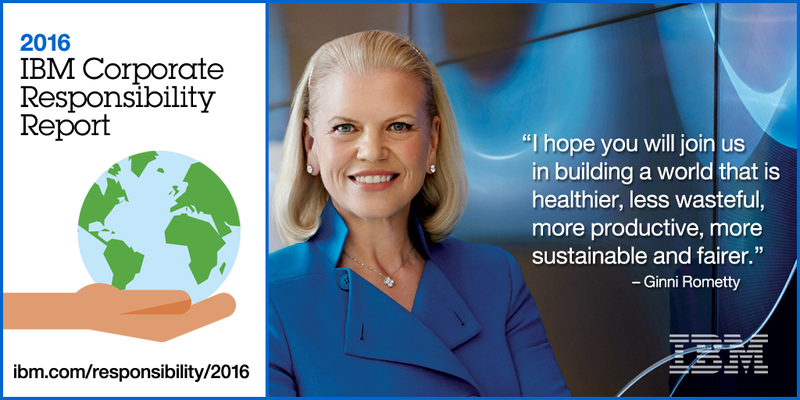 The 2016 IBM Corporate Responsibility Report details these initiatives and large portfolio of other efforts around the world. We actively seek out partners from across civil society and government, often collaborating with both – taking the initiative, approaching complex problems as systemic challenges, and working to create lasting, institutionalized and systemic solutions. We also report each year on how IBM continues its history of operating as a responsible company in our commitments to environmental protection, to inclusion and opportunity in our global workforce, to ethical business practices, and much more. Communities ~ We contribute technology, time and expertise to create innovative solutions to social challenges. The IBMer ~ We help IBMers increase their expertise and engage their professional development. Environment ~ Our commitment to environmental protection encompasses all our business activities worldwide. Supply Chain ~ IBM requires its 12,000 suppliers to demonstrate social and environmental responsibility. Governance ~ IBM has a culture based on ethics and integrity, guided by a rigorous system of governance.